In January this soup will be especially welcome in the cold weather. Homemade soup has many advantages, it’s not only very tasty but is cheaper than buying cans or packets. 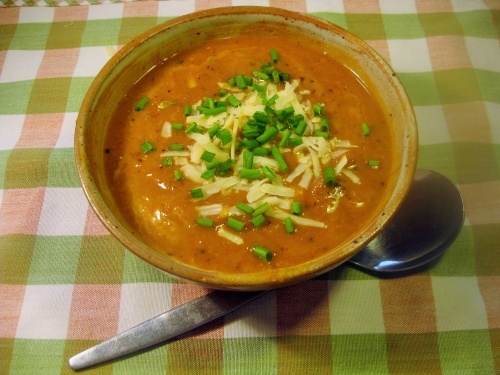 This is just the soup for cold days, it’s so comforting and is very nutritious too. Make the full quantity because any left over can be frozen for another day. In a large pan melt the fat, add the onion, carrot, celery, potato, garlic and bacon. Cook gently until they begin to soften. Add the lentils, tomato purée, bayleaf and herbs with the stock. Bring to the boil and simmer for about 30 minutes or until the vegetables and lentils are soft. Remove the bayleaf and blend the soup in a liquidizer or with a hand blender. Add salt and pepper to taste. To serve - sprinkle with chopped chives or parsley and grated cheese (optional).